Since 9.11 there has been a spate of reported incidents of people randomly seeing the number 11.11. You know the type of thing – 11.11 jumps at you from a page, a scoreboard, bus time-table,petrol bowser or a mystical grab of a digital clock at exactly 11.11. Chance maybe, coincidence definitely but for some it is happening beyond mere chance and coincidence. A journey of self-discovery will nudge us with cryptic clues that are intended to guide us. Three words, Finding Your Voice, the title of my first book had been flirting with my subconscious to no avail for several years. After all I had found my heart, writing was without doubt the imprimatur of my soul. I needed no goading no nudging into writing, my computer became my altar where running words in my head was given the breath of life from the keyboard. But during this past year or so the synchronistic crumbs of FYV have been unrelenting in getting me to see a bigger picture. Sometimes things can be so blooming obvious that we are blind to them. But my muse was not – she was insistent that social injustices needed a commentary until words circled my head like vultures looking for a feed and only quietened when I found my voice through my Blog or a Face book posting. Finding Your Voice, which I had chosen so decisively for my book of self-help guide to public speaking, was much more than a title; from the very start I could now see that it had been an intuitive directive for me to find my own voice. Yes I spoke in public but throughout my life I had always held back anything that might be regarded as contentious. But the paradox was any voice suppressed is under enormous pressure and when grievances reach danger levels we erupt. All of the stuff that I should have said in a reasonable balanced way blasted pugnaciously from me like a scene from The Exorcist. So for someone whose ego so desperately wanted to please and be liked it was a tough road to consciousness. I understand now how each synchronistic piece of the puzzle fell into place knowing that finding my voice and speaking or writing it in a well-considered manner is inherent to writing with authority as well as being crucial to my well-being and sense of authenticity. But of course the crumb trail of Finding Your Voice is still much more. Look out for my next Blog about how I can help you find your voice, your truth. 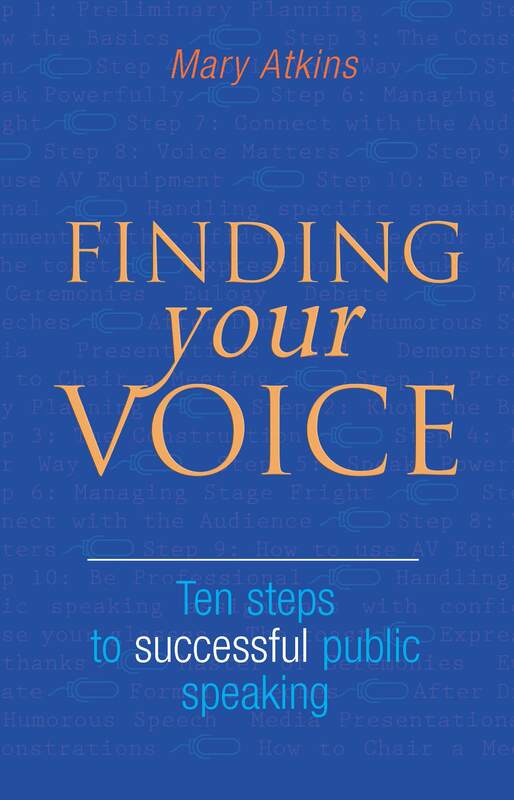 Finding Your Voice was published by Lothian in 1985 and was promoted as the definitive self-help guide to public speaking. The first part of the book was the how to and the second half devoted to every type of presentation that may be undertaken by the reader – from eulogy to debating and workshop presentation to after dinner speaker. Now out of distribution it is available in public libraries and recently can be purchased as an E-Book on Kindle.